Long time we have no news about a Tournament in Battlefield 1942. But Granate from the Battlefield 1918 Community tell us, there are starting a new Tournament battle at Saturday 23.March. At the moment 25 players actually register. You can be one of the part in that regiment you like to play Triple Entente or German Empire? Battlefield 1918, Forgotten Hope 0.7 and FHSW during a lot of Tournaments over the years in the past in the old forgottenhonor.com community. On this way they want to plug-in the new cmp-gaming.com community in the future. The during Tournament people want to bring you back the good old Tournament experience you like. One big of the reason of the long silence about during public Tournaments was the forgottenhonor.com change the website and grow up in a new community it calls cmp-gaming.com. Summer 1914, the whole of Europe is falling deep into the Chaos of war, a conflict unknown by its new nature; a gigantic, brutal conflict involving millions of men fighting a senseless war. Soon, iron will rain heavily and the corn fields of Western Europe will be flowing in blood. On this day, the most wonderful summer of the century will turn into Hell. From the smal﻿l Belgian towns to the large fields of the east of France, passing by the narrow streets of Ypres, relive the ye﻿ar when the old world died for a new one, which changed everything. Which side will you choose ? Will you fight for The Triple Entente to defend Belgium and France against the German appetite for new territories to conquer? Or for the German Empire to exert it's full power over the old continent? 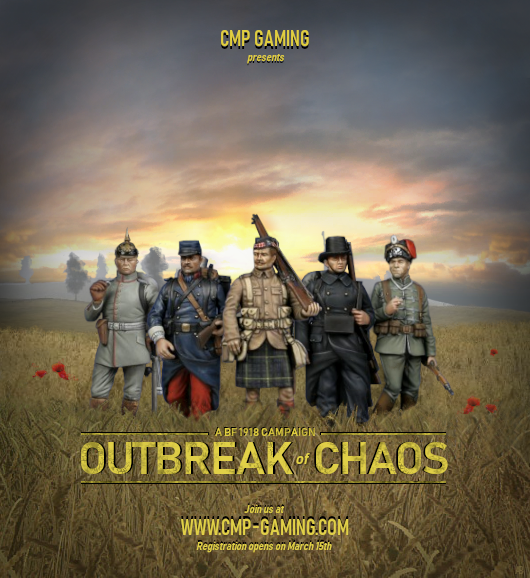 Whichever side you fight for, join us in our new Battlefield 1918: Outbreak of Cha﻿os. What is a campaign? A campaign is a series of connected battles, where we recreate the timeline of the war. Campaigns are played over 8-10 weeks and every Saturday we will have a 3-hour battle with multiple rounds. All battles are counted towards the final score which determines the army that won the overall campaign. Battles will take place every Saturday evenings at 18:00 UTC. How much Campaigns will be played? How long runs a Saturday Night battle? Which side i can join? How much players register now? When starts the Saturday Night battles? What i need for Downloads to be one of the part? You see under the point "Requirements"
Where i can register for this Tournament? For what i need Teamspeak 3? You need it for the Tactical movements and orders in game. Saturday 23. March starting the first Tournament battle. Bilder die noch Fehlen folgen später hier im Thread. Wichtig wird es sein englisch oder russisch sprechen zu können.